Saab have just reached a mammoth 100,000 likes on their Facebook page and released a couple of images on Flickr made up with images from a lot of fan pictures. Pretty impressive. And a good choice in the Saab 900. 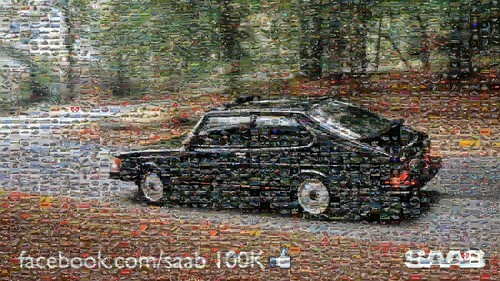 Saab 900 Mosaic – small, originally uploaded by Saab Cars Official. Unfortunately this isn’t a how to guide for linking photo albums on Facebook. The functionality to link currently isn’t available. This is all about how it could work, in theory.